You are here: Home / DIY / Build It / I Upcycled an Old Crib Into a DIY Coffee Table! I upcycled an old crib into a table. And I absolutely love it! In fact, those are the moments I love the most. And suddenly you’ve got a really creative idea that you totally didn’t plan. That’s what happened to me last week when I took a chainsaw and a jigsaw to my son’s old crib. Let’s first be clear that if I could have donated, sold, or given that crib to someone else, I would have. But if you didn’t know, cribs that have a drop side have been banned. Oh yes–banned, I tell you! 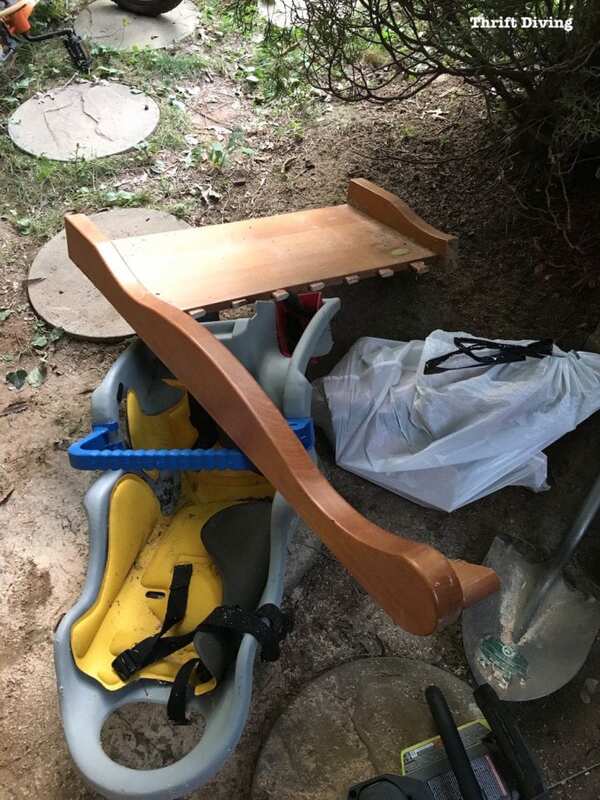 Which left parents like us that had dropped $500 on a crib no other options but to either break it up and use it as firewood…upcycle it…or guilty dump it in a landfill somewhere. Well, you know I don’t dump because I think nearly everything can be reused. 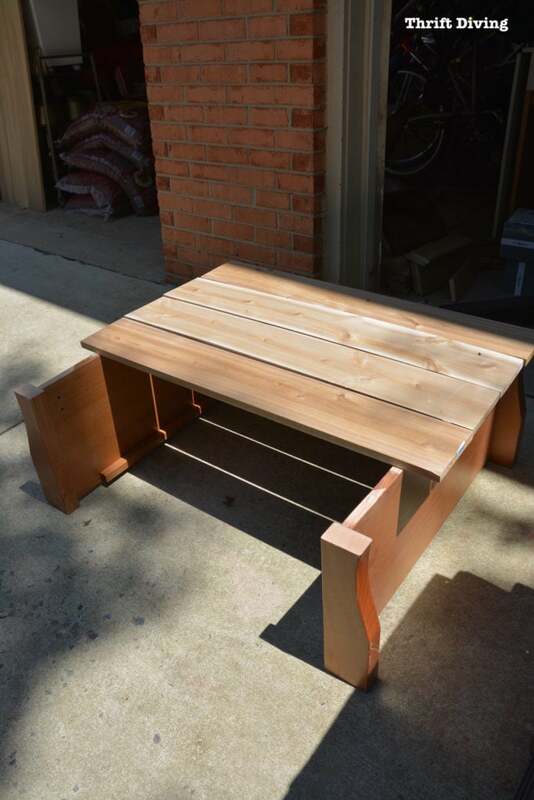 So I upcycled my sons’ crib into a coffee table for my patio! While cutting it into little pieces and salvaging what I could and bagging up the rest (since the trash won’t take awkward items like this), inspiration struck! 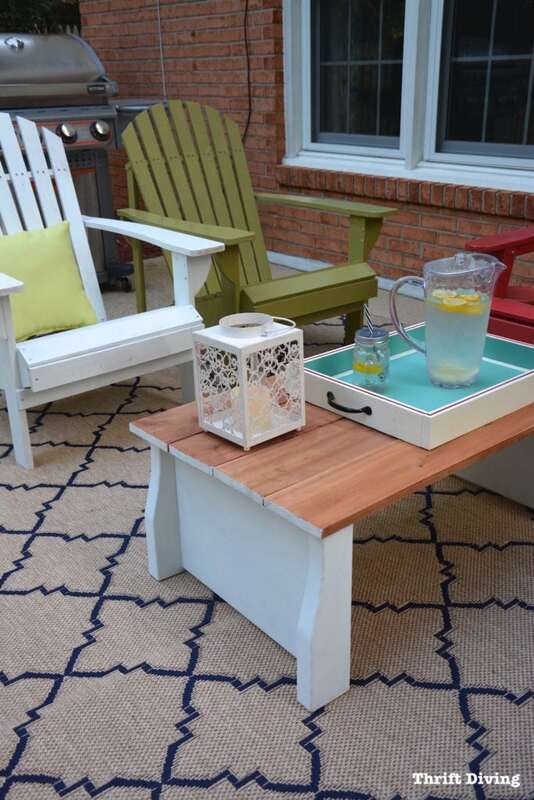 Well…more like a table for my patio, which was getting a patio makeover for my Outdoor Overhaul challenge! 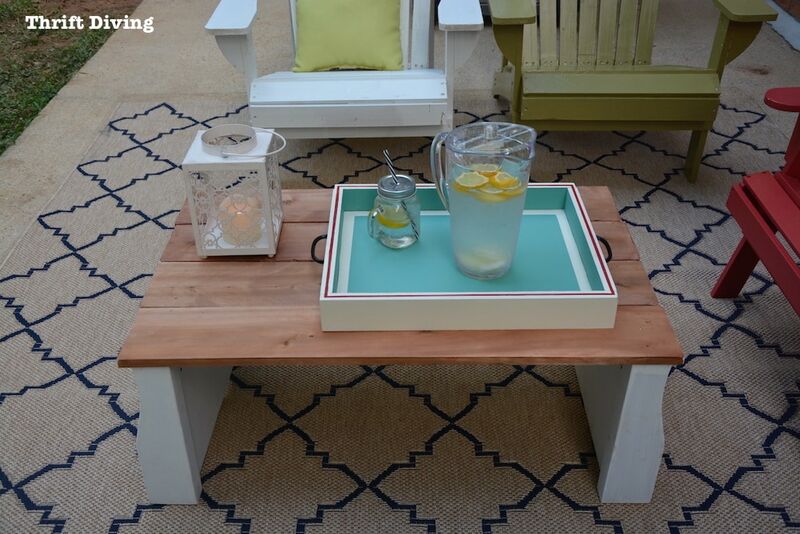 The looked like cute little bases on which I could totally make a DIY coffee table! 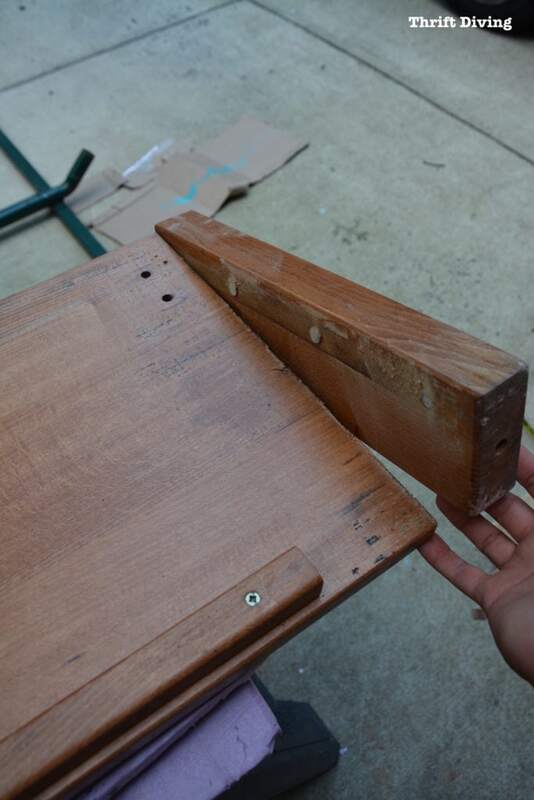 I even cut the slats off and started experimenting with upcycling those, as well, to create the top of the table. But there weren’t enough…and plus, I wanted something that would last in the elements! I ended up using cedar wood for the top, and the result is awesome! Now I’m going to show you exactly how I did it! STEP 1: Find a Solid Base! 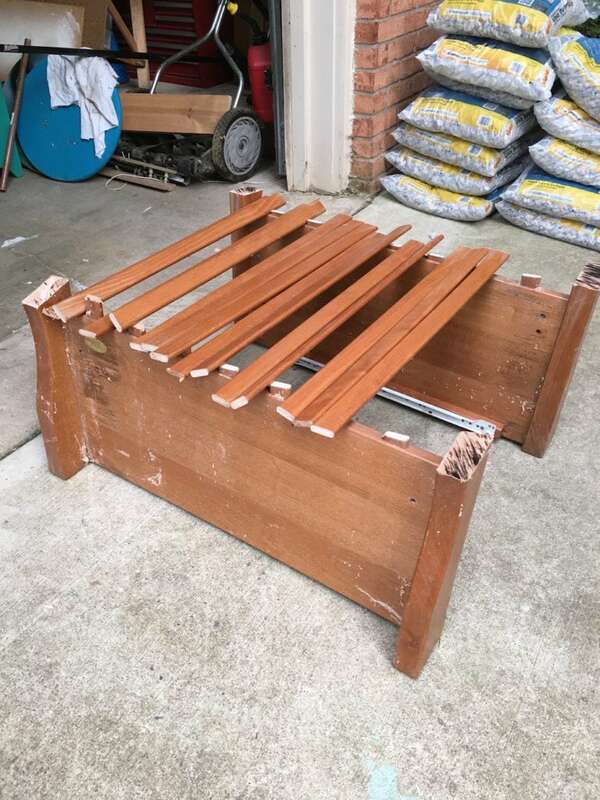 If you’re using a crib, most cribs, most cribs just have slats all the way around, but some cribs, like ours, had a pull-out drawer underneath. 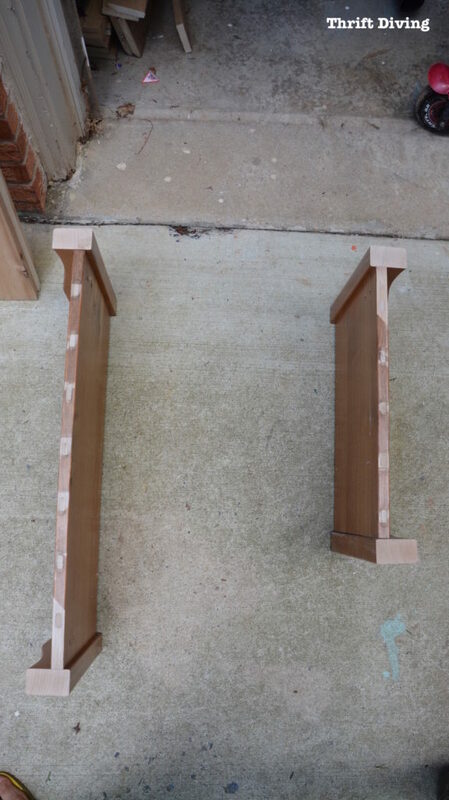 And to accommodate the drawers, the sides of the cribs had solid bases. When I saw the cut up crib like this, I knew this would work perfectly! 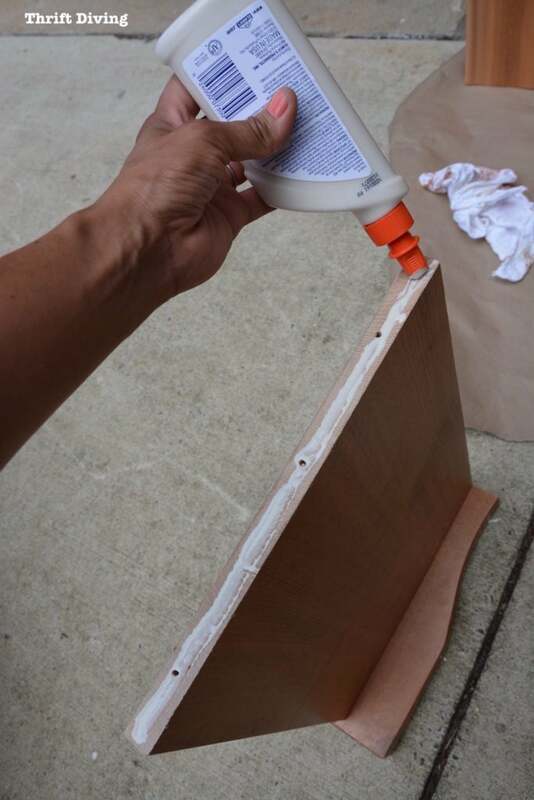 Keep in mind that if you have an old bookcase or bookshelf, you can make a sturdy base from it! 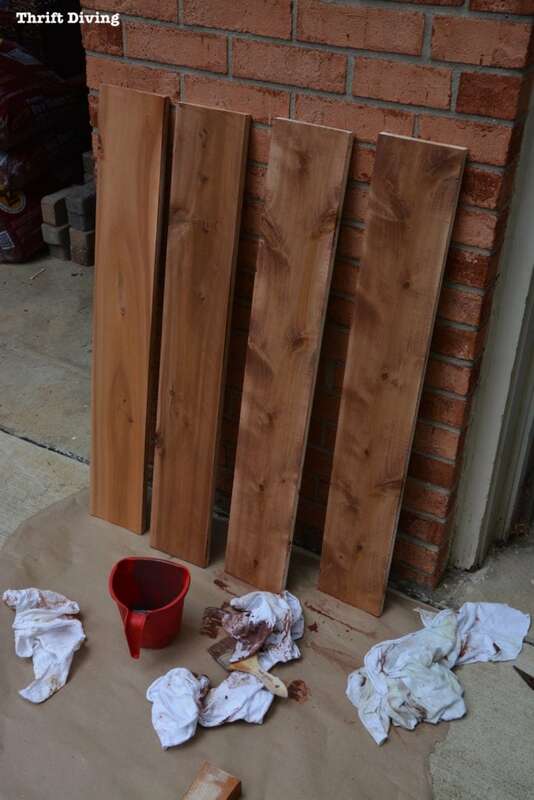 STEP 2: Get You Some Cedar, My Friend! 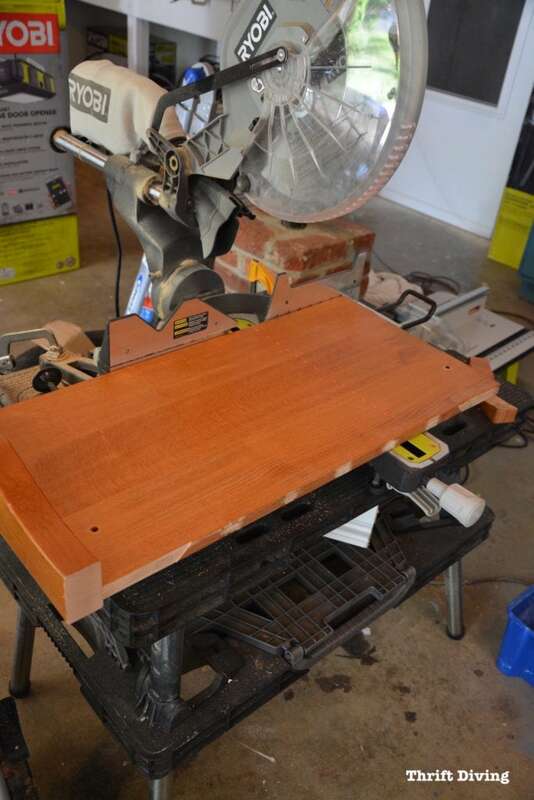 It’s tempting to use cheaper wood for projects, because it’s soooo expensive to buy wood! 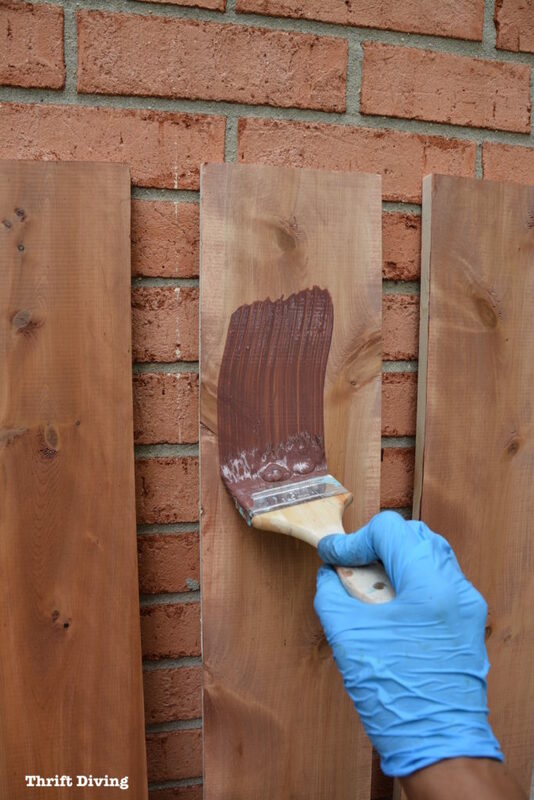 But if you’re doing an outdoor project, use the good stuff, like this cedar. It naturally resists the elements! 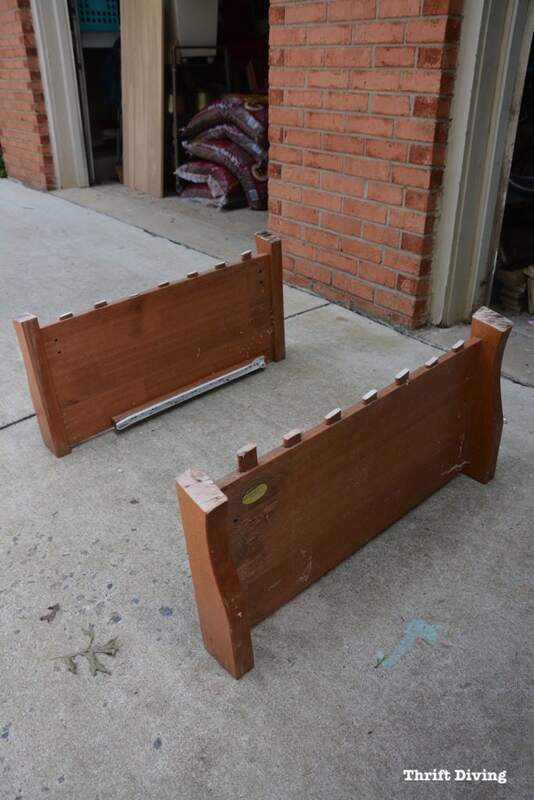 These were two 6-foot long cedar boards, about 6″ wide. I had them on-hand so I didn’t need to buy more. I marked them evenly in the middle and then used my miter saw to cut them. STEP 3: Getting Jiggy With the Jigsaw! Look how raggedly they were! 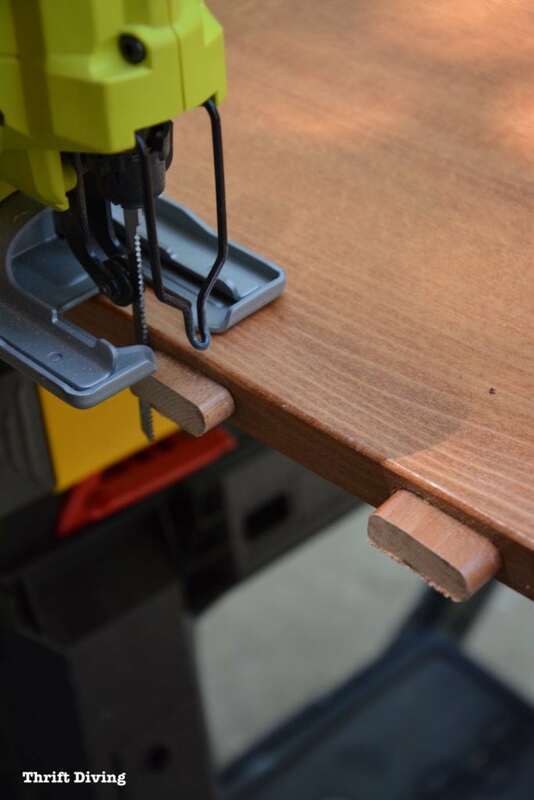 So it was time to bust out my favorites: the jigsaw and miter saw! Click here to learn about the tools you should buy and how to use them. The first thing I did was remove the drawer rollers, which is where we stored my sons’ clothes. 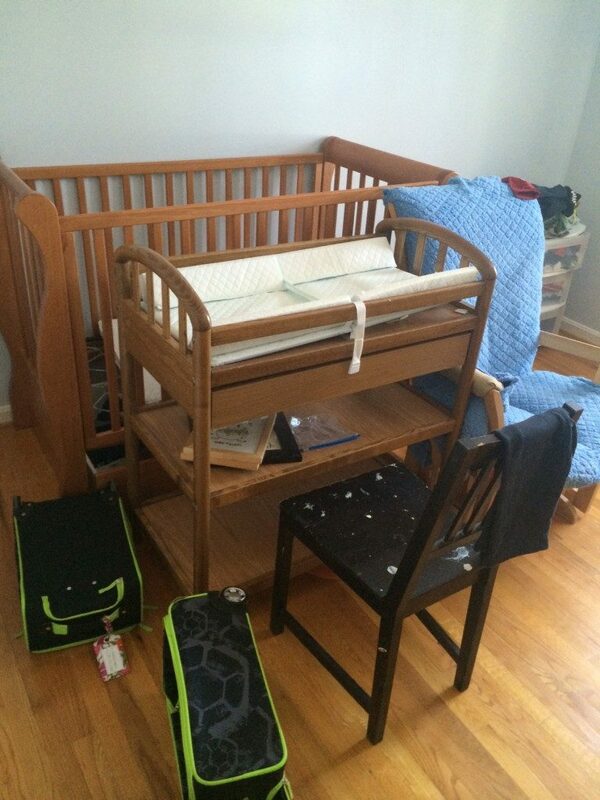 How sad to be deconstructing their crib, but happy that it wasn’t all going to the dump! 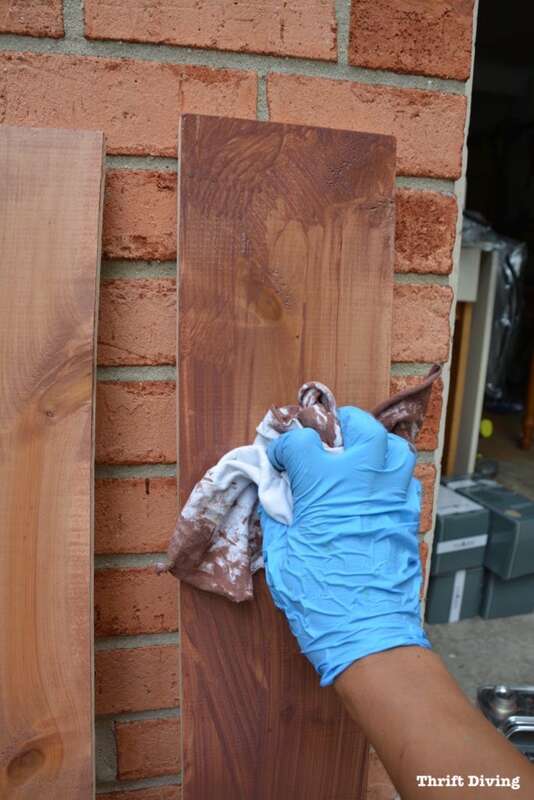 Then I used my jigsaw to trim off the slats, to create an even surface. The jigsaw is one of my favorite tools because it can get do so much! With all the slat stumps gone, I was ready to cut the legs to make it flush with the top, too! I marked where I wanted my miter saw to cut. I placed it on my miter saw and veeerrrrry carefully cut! 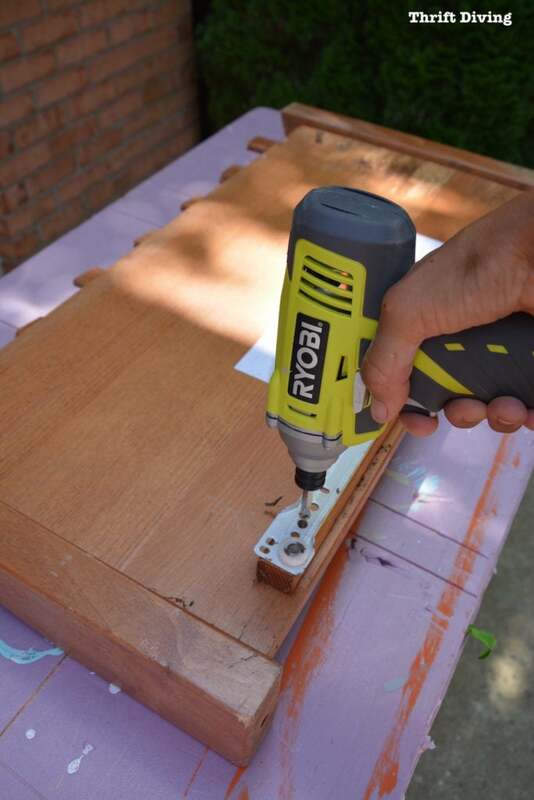 This is why it’s so cool to know how to use power tools! Because without them, you’re limited in how you can upcycle things! With tools, any idea you can think up you can make happen! All freshly cut and even! STEP 4: Waterproof the Top! I wish the body were waterproof, but it’s not, so over time, it may get destroyed. We shall see…But I definitely wanted to make sure the top was waterproof! 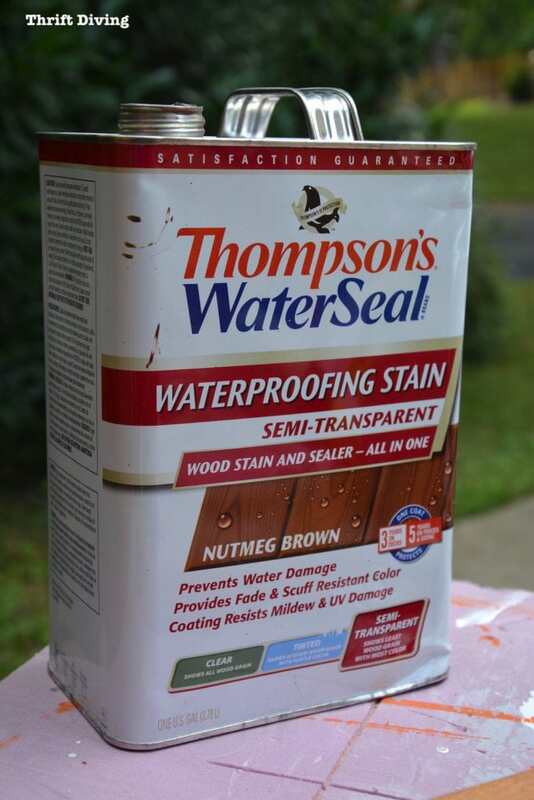 Not only is it cedar, which is naturally resistant to the elements, using Thompson’s WaterSeal Waterproofing Stain will help make it more “hearty” to the outside elements. First I “painted” on a bunch. Then I used a rag to wipe it off. I like the color I was left with! Subtle, but definitely with some color! STEP 5: Does the Body and Top Fit?? Sigh….the project was going swimmingly…. The crib sides were too long…and I didn’t have any extra cedar! Waaaahhh!! Don’t you hate when stuff like this happens during projects?! 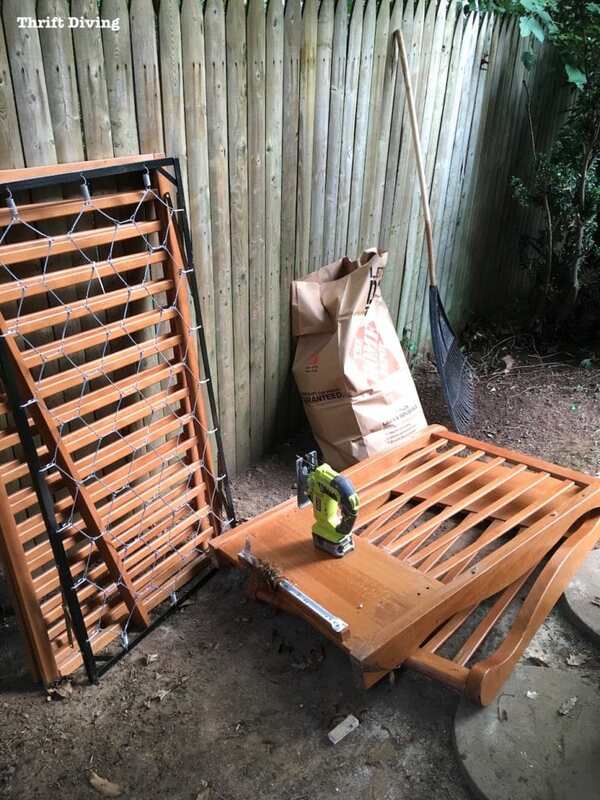 If the base doesn’t fit, you have one of two choices: 1) buy more wood for the top, which means more money and wasting time driving back to Home Depot…..or, 2) trim the base. I decided to trim the base. I did this part while the waterproofing stain was drying. I pulled out my trusty jigsaw again and separated the legs from the body. 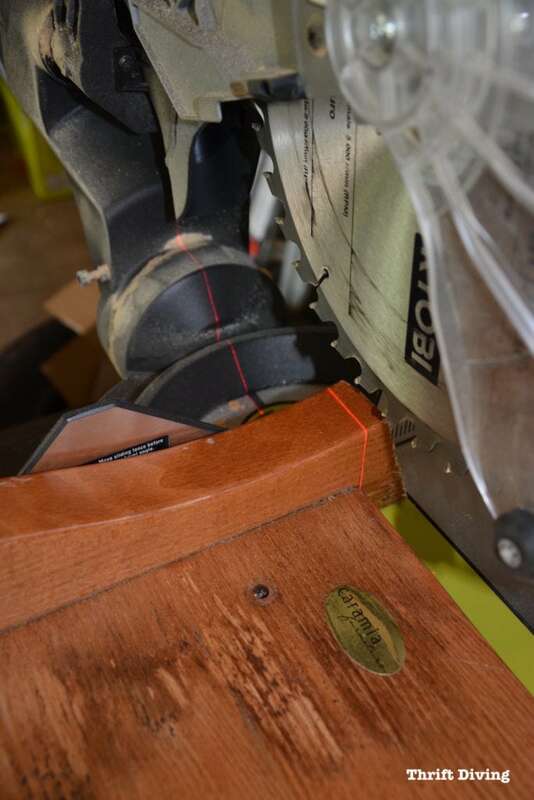 I trimmed the body on my miter saw, after measuring. I cut off about 7-8 inches. You can see here after doing one of them how much shorter it was than before! The shorter size would easily accommodate my cedar planks! 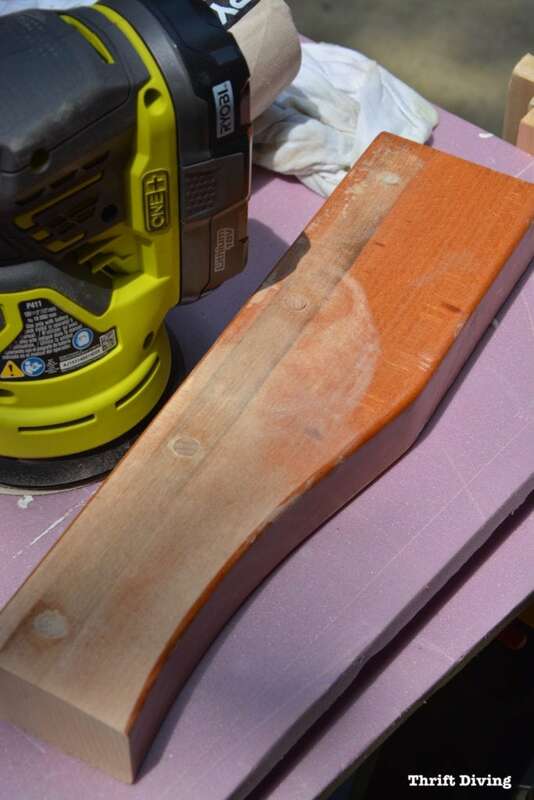 I sanded the little leg smooth with my RYOBI sander, so that it would fit well when I reattached it. 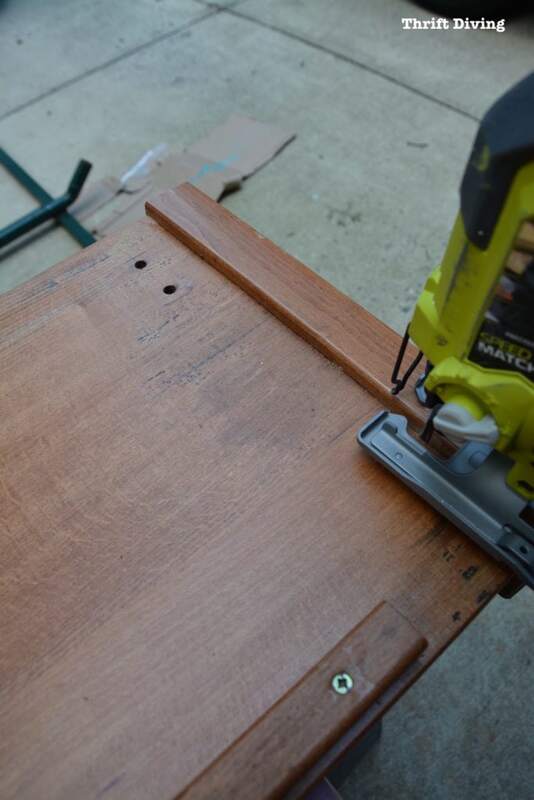 STEP 5: Pocket Hole Time! 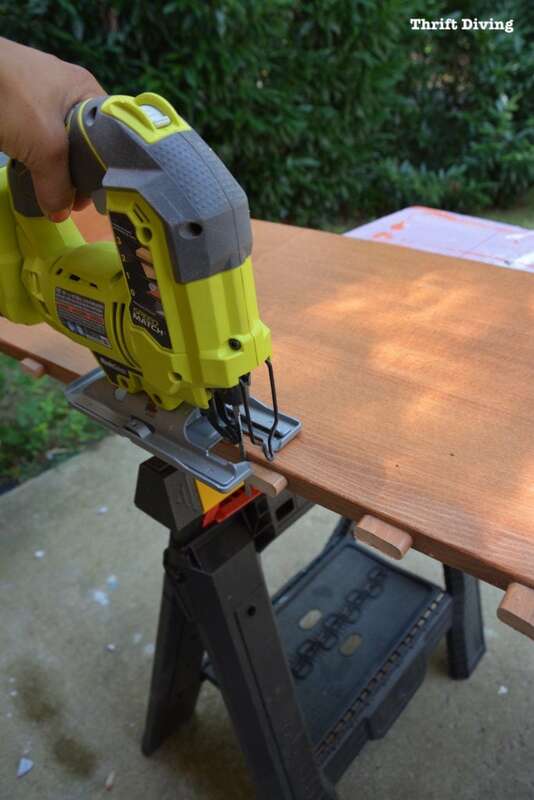 If you’re new to building, you may have never heard of the pocket hole. I haven’t been using it a ton, but it’s come in handy when I have used it! It’s basically a reeeeaalllly easy way to drill an angled hole, insert a screw, and then join two pieces of wood to form a strong joint. I’ll do a tutorial for you soon! They make building a cinch! 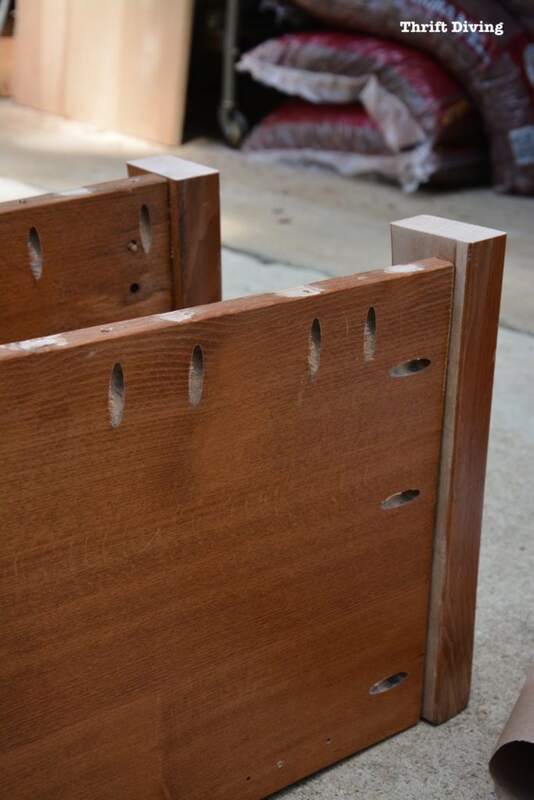 I have created pocket holes for the sides (to rejoin) the legs I cut off, and to secure the top cedar planks. 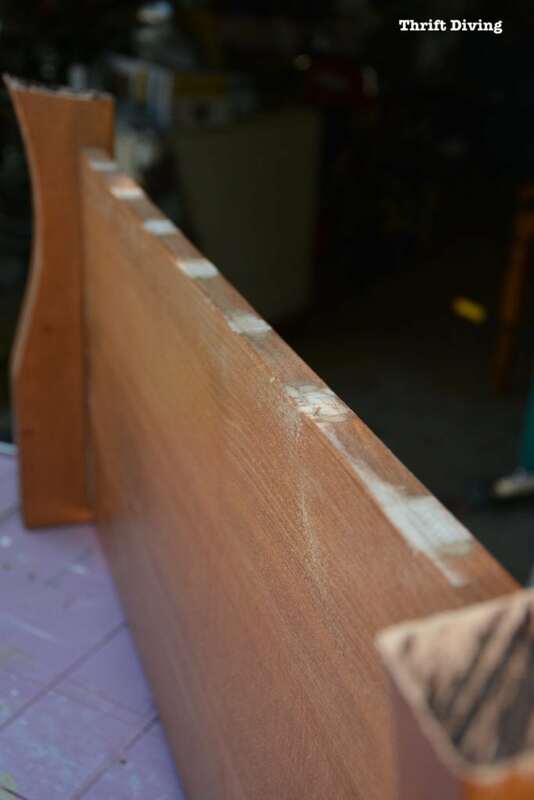 After all the pocket holes were trimmed and drilled, it was ready to put the side of the crib base back on. Then I used what was definitely the wrong pocket-hole screws on this project! 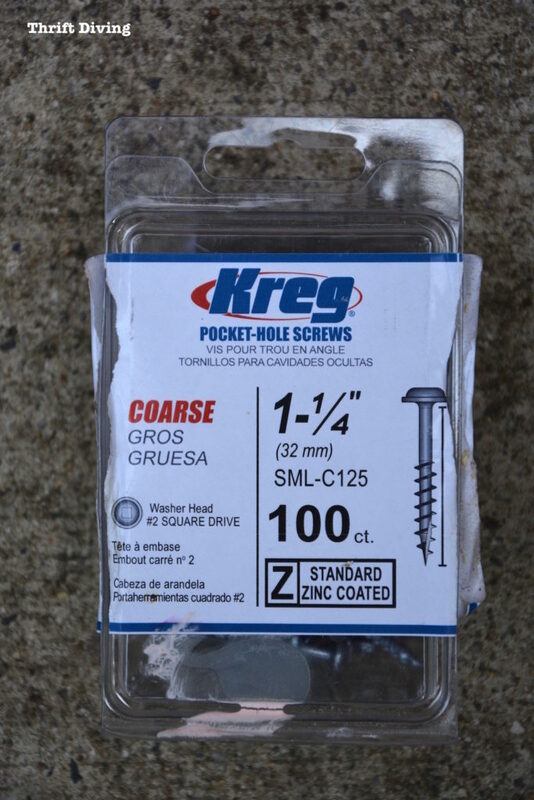 I should have used the weather-resistant blue pocket-hole screws, but I didn’t have any on-hand, so I’ll have to buy those and replace these ones, which will rust outside! 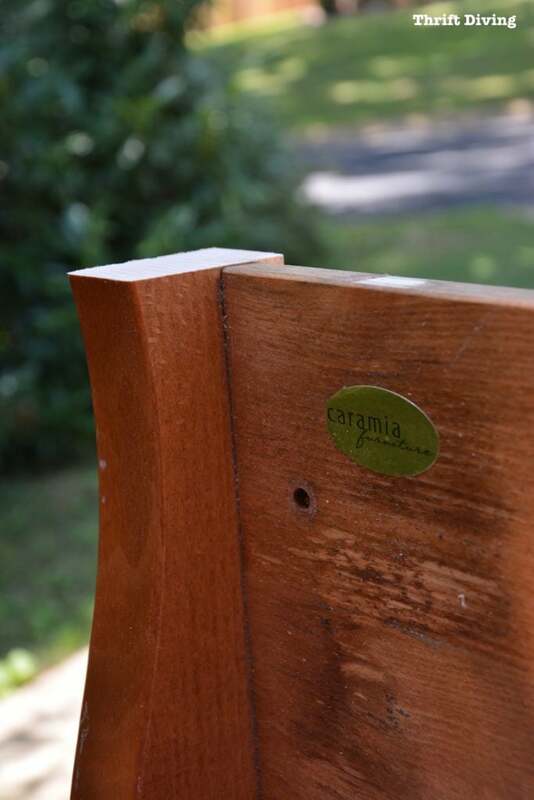 When using pocket holes like this, it creates a nice, tough 90-degree join! STEP 6: Paint the Base! 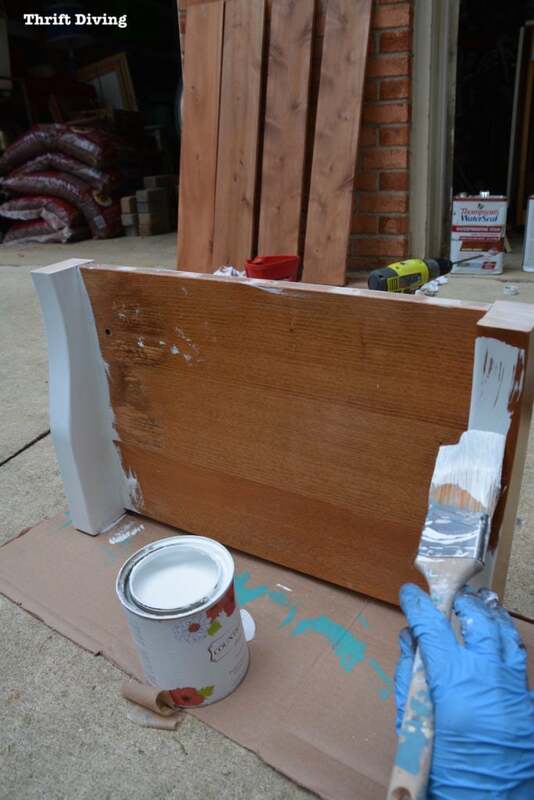 I can only hope that this Country Chic Simplicity paint that I used will hold up outside! I know that you can use Annie Sloan Chalk Paint outside (just don’t wax when using outside). So I hope that is the case with Country Chic chalked paint, as well. STEP 7: Screw It All Together! 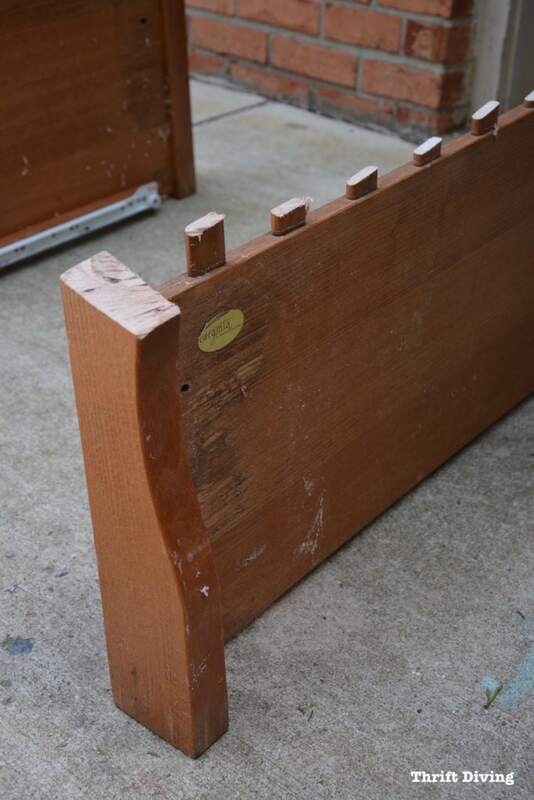 This was a blogger FAIL because I didn’t get good pics of the screwing down of the crib base/legs! 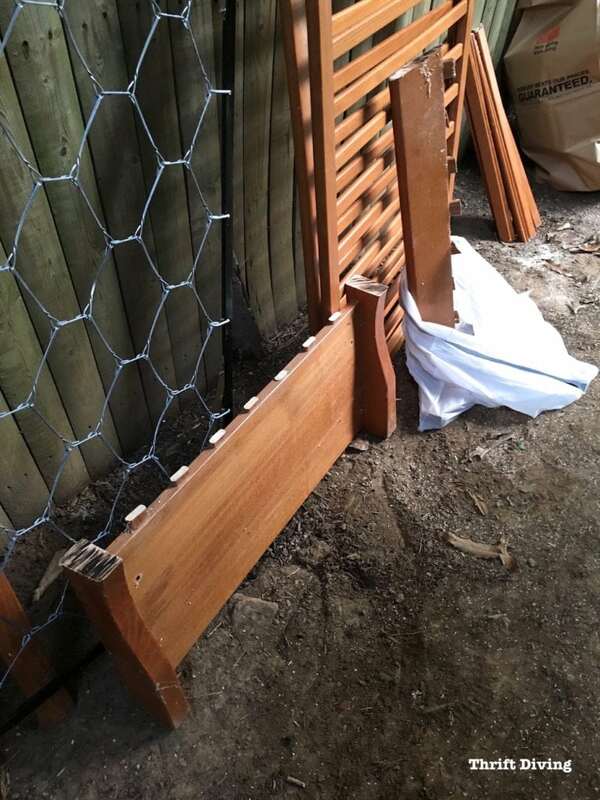 But what I did was lay the four pieces of cedar down on the ground, with quarters in between to keep them evenly spaced, and then secured the base to the top with the pocket screws, using my power drill! 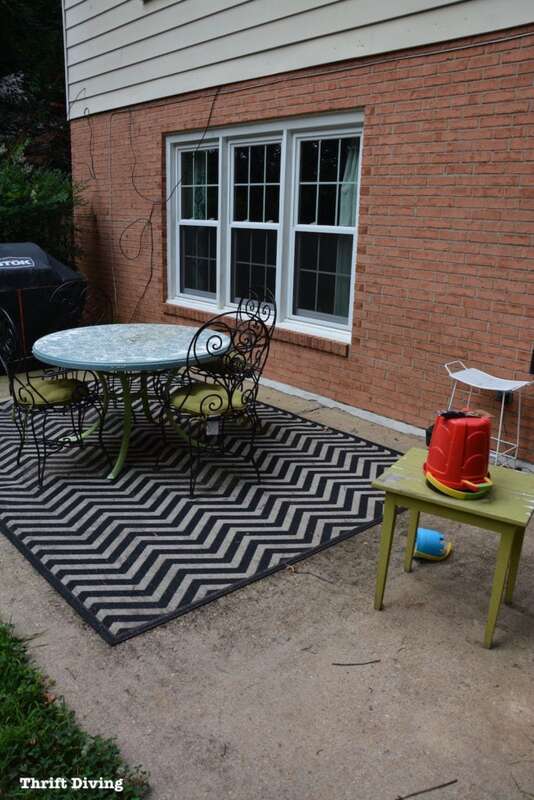 The patio and yard makeover were expensive enough (don’t ask–I stopped counting after 3-4 trips!!!). So the fact that I was able to create a table to unify the space without having to spend more money, was appreciated! If you recall, this is what my patio looked like before. 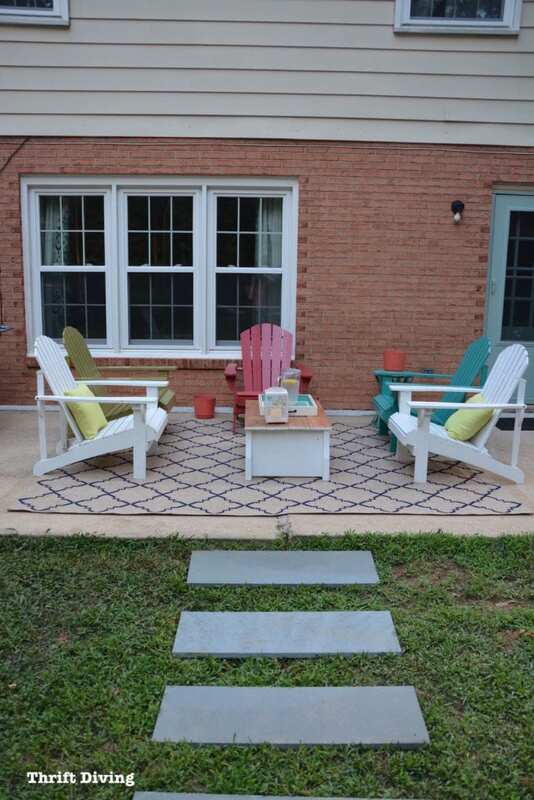 With the freshly painted Adirondack chairs and new DIY upcycled patio table made from a crib, the space is now ready for my family and friends! My friends and my family have already been enjoying the new space with me! 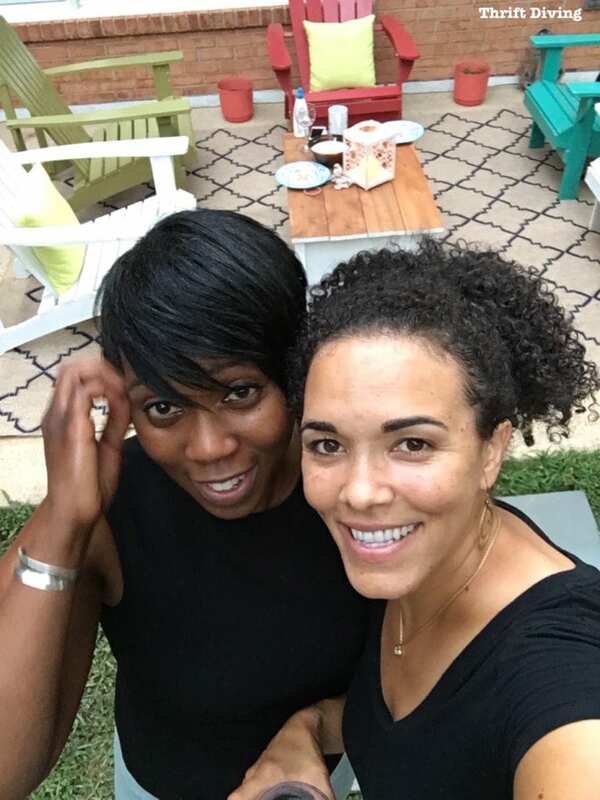 My best friend came over for wine and impromptu backyard dancing. HA! And you’ll be happy to know that I’m having a little get-together in a couple of weeks! This is exactly the kind of space I’ve wanted since moving in here in 2010. 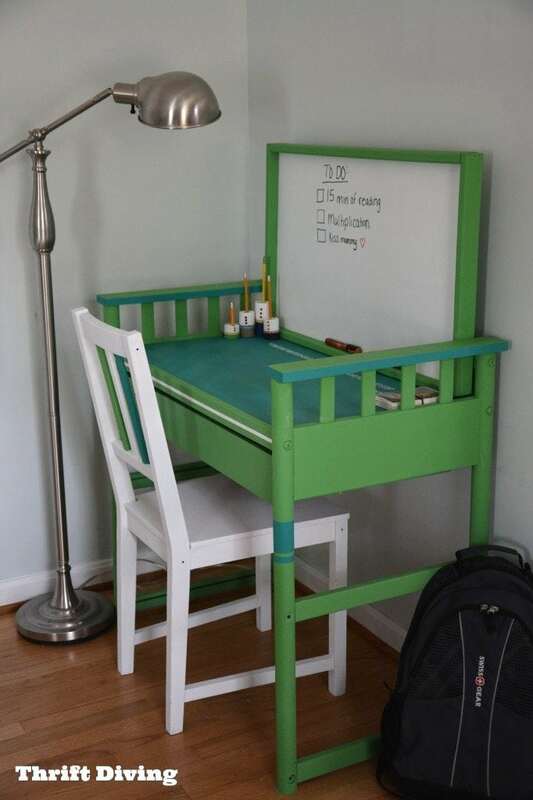 See how I upcycled my sons’ thrifted changing table into a desk! So what do you think??!! 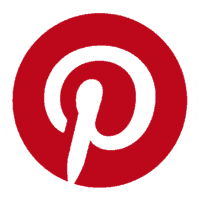 Leave a comment below…..and considering SAVING this project on Pinterest! Go ahead and pin this for later so you can come back to it! Brilliant! I love reading about your projects, you are truly inspiring! Thank you! Wow! Turned out great! Thanks for sharing at #HomeMattersParty hope to see you back! What an awesome upcycle, Serena! It’s a shame that cribs can’t be donated but I can see why they can’t. You were so smart to think of a way to use yours. Wow Serena, this is such an innovative way to repurpose the crib. I know a lot of people just leave the slats. I love your creativity, it is truly a unique piece. Also, your tutorial is excellent. I’m going to share it with the hubs and see if he will buy me a few of those cool toys you are using. Pinning and sharing. 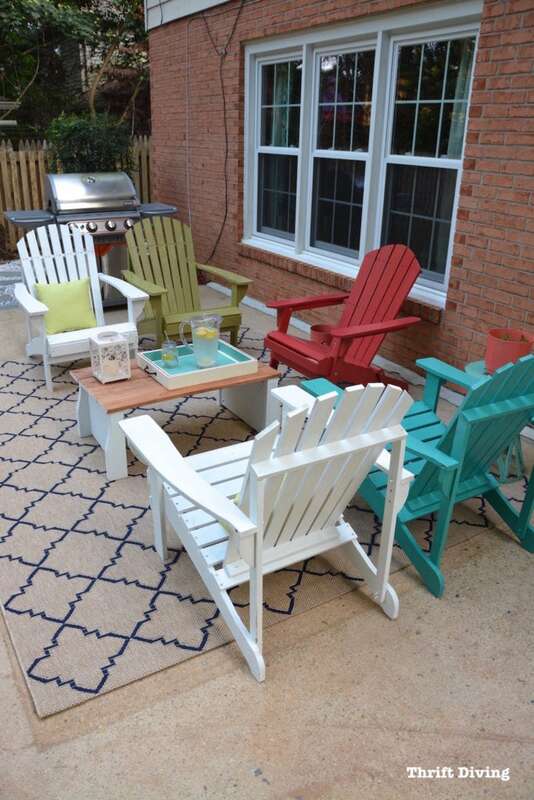 Wow, I love the patio makeover and never would have guessed the table started out as a crib! Pinned to my Furniture makeover board. I used the metal bottom part of my sons baby bed in the garden to run cucumbers up. Worked great ! Take the springs, some left over wood and some heavy gauge string wire and create a wall garden. Measure the openings in the springs, get planter pots that will fit in the space leaving about an inch of the pot above the spring. On some springs, you can slightly bend them to get a pot to fit snug. 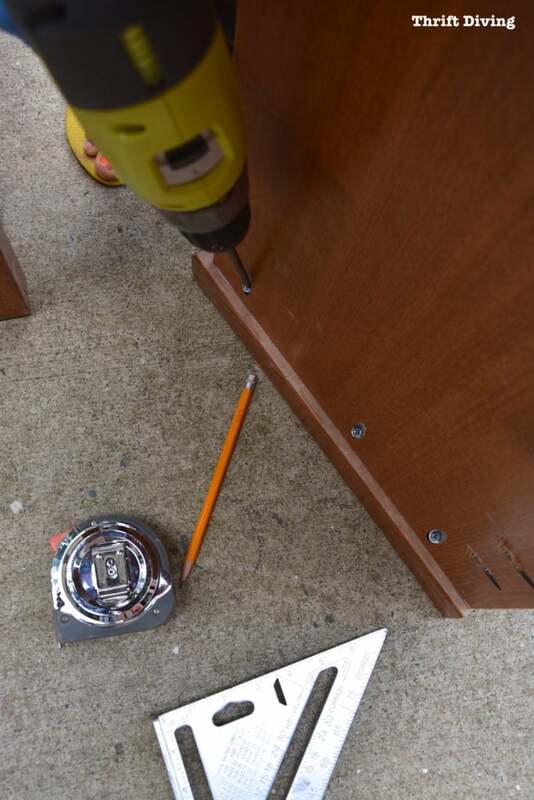 Count the number of hooks around the frame and get the same number of strong self-tapping screws. Make a note of the size of the hole that the spring goes through and get a screw that is a little smaller because you will be pitting some wire through that hole as well. With some pots in the springs, measure the height of the part of the pots that is below the springs. For instance, if you bought pots that are 6″ tall and 1 inch of the pot is above the springs there should be 5″ of pot below the springs. This measurement is just to make sure you have enough space for the next step. Take that heavy gauge wire and wrap it 2 times between the two sides of the hooks that hold the mattress to the frame – basically going through the hole in the frame – and then through the hole in the bottom of the hook – the part that holds the hook to the mattress. If you have one of those mattresses were the hook is open at both ends, then run the wire under where the hook attaches to the spring. You will build the support for the wall garden. 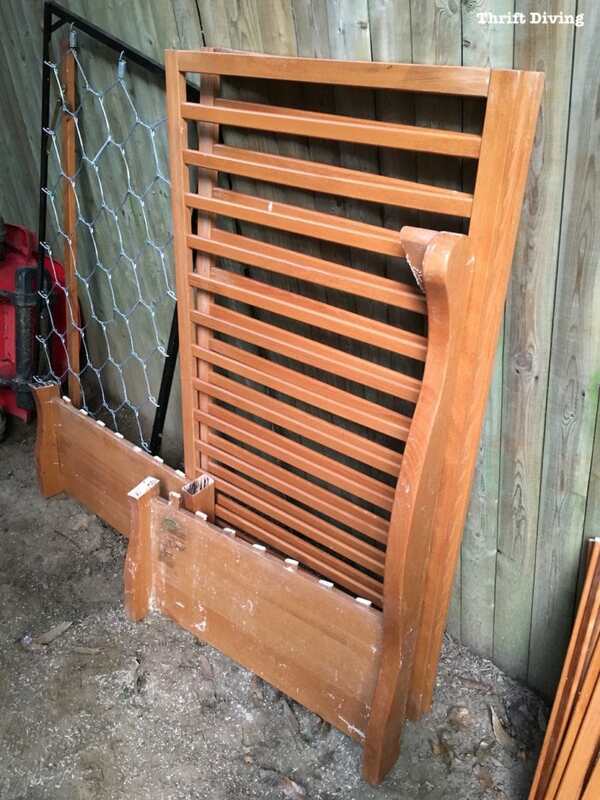 If you have it, use outdoor 2x4s for this – the support need to be sturdy to hold the weight of the plants. If your measurement in step 2 was 5” you will be cutting pieces of the 2×4 into 5” long. 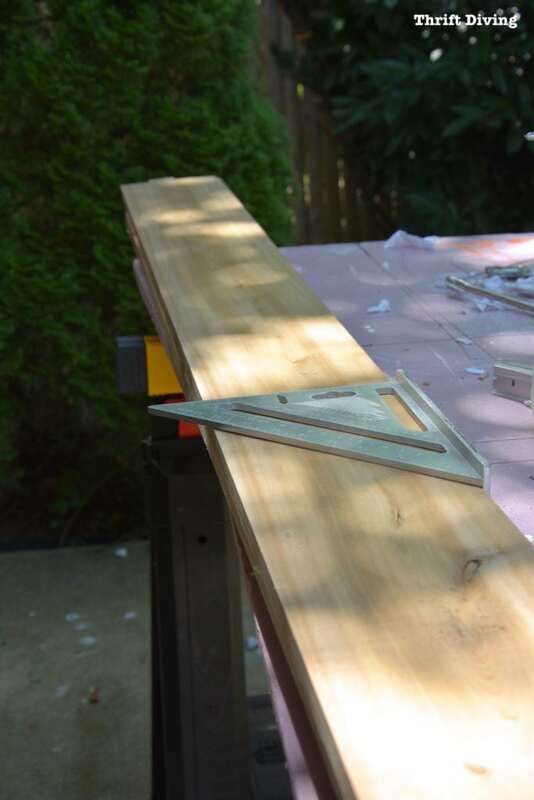 Take the measurement from step 2, and cut enough 5” sections to be able to put 1 section every 6 or so inches. 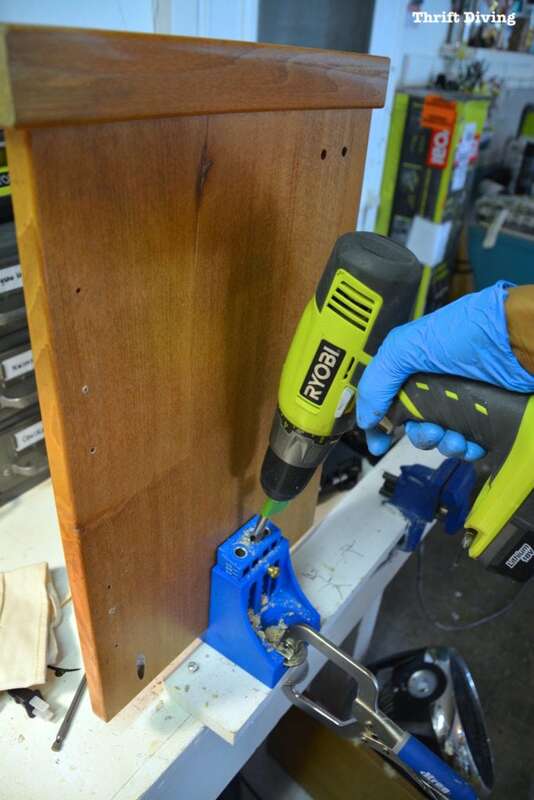 Run the self-tapping screws thru the holes where the hooks are and into the 2×4 that you cut. Make sure the longer side is facing away from the springs. Now, you are ready to mount it. 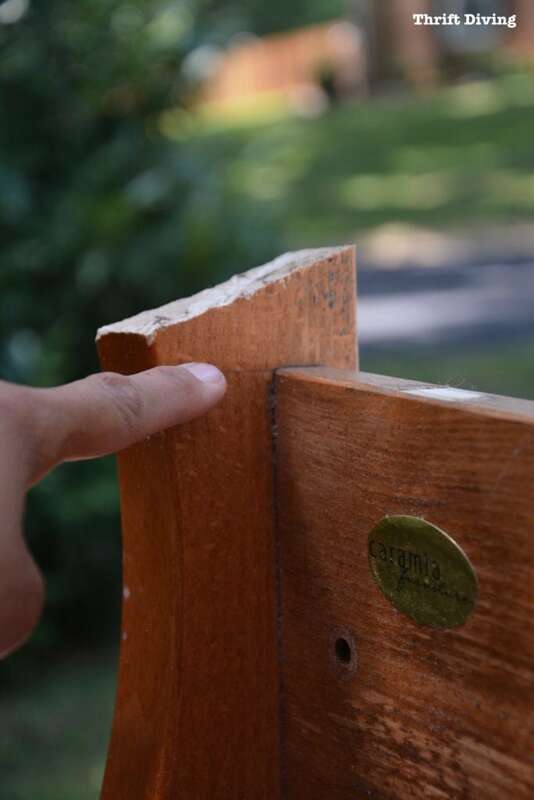 You can use angle brackets & concrete screws to mount it to a cement/stucco wall, or angle brackets and wood screws to mount it to a wood fence. I love this idea, Judith! The sounds like it would fit on my fence! Thank you!